Heat the broth, black pepper, celery and onion in a 3-quart saucepan over medium-high heat to a boil. Reduce the heat to low. Cover and cook for 5 minutes or until the vegetables are tender. Remove the saucepan from the heat. Add the stuffing to the saucepan and mix lightly. Spoon the stuffing mixture into a 2-quart shallow baking dish. 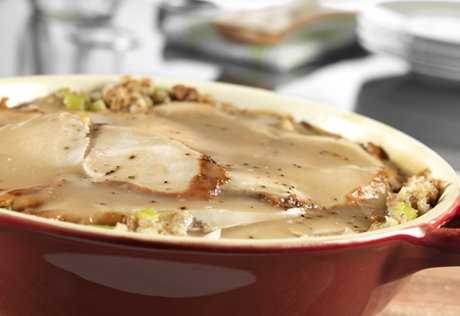 Arrange the turkey over the stuffing. Pour the gravy over the turkey. Bake at 350°F. for 30 minutes or until the turkey and stuffing are hot.